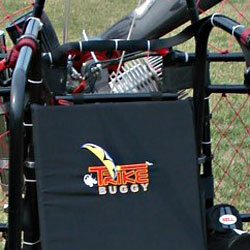 The TrikeBuggy Embroidered Back Pad is taller and thicker than the PPG Back Pad. It is a full 30" tall to give you the most comfortable ride. It is embroidered with the TrikeBuggy logo, so all your envious friends can know what to call your great flying machine! Now available in the original soft back or the new Stiffened version for low back support.